The father of the boy who was killed in 1994 along with O.J. Simpson’s ex-wife wants some of Simpson’s post-prison earnings. O.J. 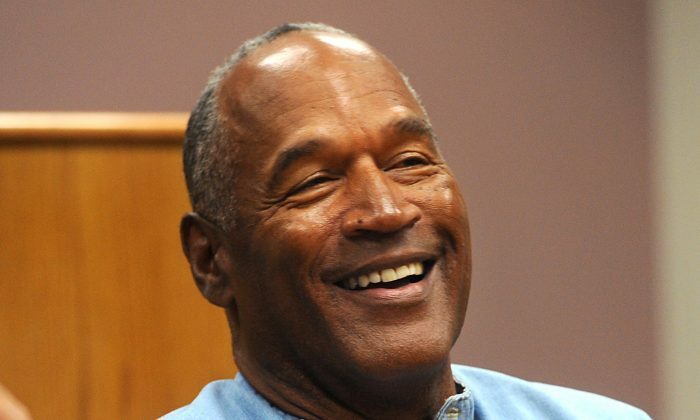 Simpson, 70, has been cashing in on autographs since his release from prison and also has several other revenue streams. David Cook, an attorney for Goldman, whose son Ron Goldman was killed in 1994 along with Simpson’s ex-wife, will ask a Los Angeles judge on Tuesday, Jan. 30, to order Simpson to hand over money he makes to Goldman. Specifically, Cook wants money that Simpson makes from celebrity appearances or autographing sports memorabilia to go to his client. Simpson was acquitted of two counts of murder in the 1994 slayings but a civil court jury found him liable and ordered him to pay $33.5 million. Fred Goldman said that Simpson has never willingly paid any of the damages. “Mr. Simpson has sought to subvert this wrongful death judgment by his abject refusal to pay, much less accept personal responsibility,” Cook said in court papers, reported CBS. But lawyers for Simpson said he only sold autographs to build up his funds immediately after his release from prison and won’t be doing so anymore. Goldman and Cook have “attempted to drag Mr. Simpson into court every time they hear a rumor, see something on television, or read in an internet news posting, a mere vague allegation involving Mr. Simpson’s commercial exploitation of himself,” attorney Ronald Slates wrote in court papers on behalf of Simpson, according to the New York Daily News. He renamed the book to “Confessions of the Killer” and had it published, reaping the earnings. The original $33.5 million in damages, though, has swelled to around $100 million, reported TMZ. Goldman also got the memorabilia that Simpson was accused of trying to steal back from two dealers inside a Las Vegas hotel room. That crime landed Simpson in jail.